To keep your air conditioning system running at peak performance throughout the winter, you need to have it tuned up regularly by a qualified heating and air conditioning company. AC tune-ups help maximize the lifespan of your equipment, catch problems early, and help lower your energy bills by allowing your system to run more efficiently. Additionally, if you have a new air conditioner, regular tune-ups are typically required to protect your warranty. At Zodiac Heating & Air Conditioning, we offer affordably priced, comprehensive tune-ups for all makes and models of air conditioners. 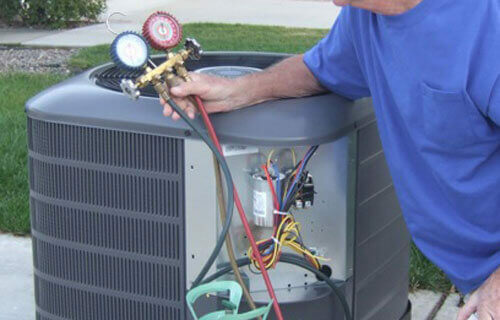 During an air conditioner tune-up, we clean the coils, check the refrigerant levels, check the electrical components, lubricate any parts that need to be lubricated, replace or clean the air filter, and make sure the unit is running properly and within the parameters specified by the manufacturers. If we notice any issues or signs of potential future problems, we will let you know and review your options. Ultimately, with our tune-up service, you'll have a cleaner and more efficient AC system that is prepared to get you through the San Fernando Valley's hottest months of the year. All AC tune-ups are performed by NATE-certified HVAC experts who receive ongoing training on the industry's best practices for air conditioner maintenance. While we often provide one-time AC tune-ups, most of our customers decide to join our Maintenance Program. Our Maintenance Members get two tune-ups per year (an air conditioner tune-up in the spring to prepare for the summer, and a heater tune-up in the fall to prepare for the winter), priority scheduling for service calls, and a 15% discount on all repairs. We can also customize our Maintenance Agreement for those who need more than two visits per year, which is particularly important if you live in an area that is extremely dusty or if you put consistently heavy demands on your air conditioning system. Make Sure Your Air Conditioner Is Ready for the Summer -- Schedule Your Tune Up Today! Call today to schedule your AC tune-up or scheduled maintenance. Appointments are available Monday through Friday, from 7:30am to 4:30pm, anywhere in the San Fernando Valley area, including Van Nuys, Calabasas, Tarzana, Woodland Hills, Santa Monica, Simi Valley, and Burbank. Zodiac Heating & Air Conditioning, Inc. is a family-owned and -operated, licensed and insured HVAC contractor based in Van Nuys. We have more than 30 years of experience and have been trained by Southern California Edison as an AC Pro Contractor. We're also a Carrier Factory Authorized Dealer that has won the President's Award for excellence in service three years in a row. I've been working with Vic and his staff at Zodiac for more than 15 years, i can't imagine working with any other AC company, They have always made sure that we are taken care of and i trust them completly, On top of that there is the excelent customer service with there knowledge and professionalism, Zodiac is always ready to take on any job big or small, we saved thousands of dollars working with Zodiac, We recommend Zodiac for any job.